Who among us can resist Angels? These lacey Angel Ornaments are so easy to make you can make them for yourself and everyone you know for decorations or gifts. Make them in Christmas colors or your favorite color or polka dotted, stripped, plain, any color that catches your fancy. Use them on a tree, on a mantle, or for package add-ons or display them all year long anywhere their heavenly spirit moves you to place them. These little Angels are sweet and simple to make and have endless variations based on the lace and ribbon you choose. Fold the chenille stem in half and slide the clothespin on the bend of the stem with a straight half going up the back and the front half going upward and twisting around the clothespin to attach the stem to the clothespin. Create the halo by making a circle with the top of the back chenille stem on the back of the clothespin. If you would like your angel to have a face, use craft markers to draw one onto the head of the clothespin. Cut the lace in 3 pieces each 4 inches long and cut the ribbon in 3 pieces, one 12 inches and two each 6 inches long. Weave the ribbon through the lace strips. Using the lace piece with 12 inches of woven ribbon, pull the ends of the ribbon to gather the lace. Tie this piece with the opening in the back with a knot to secure it and then take the remaining ribbon tails around to the front and tie a small bow. Using one of the 6-inch lace pieces, pull the ends of the ribbon to gather the lace. On the clothespin below the first lace strip, tie this second strip in place with a knot with the opening in the back and cut the ribbon tails with short pieces below the knot. Push this piece up the clothespin under the first piece to create a ruffle like effect. Put a small rubber band over the Halo and the head and neck under the lace to secure the chenille stem, cut the ribbon tails and roll a small rubber band from the bottom up to hold the ruffles in place then fluff up the lace as needed. Using the last lace strip pull the ribbon tight to gather the lace into wings. Put this crosswise at the top of the back below the neck of the clothespin and tie the ribbon tails back to front and tie and knot to secure the wings. These are designed to sit on a branch or to slide onto mantel centerpieces or to slide under ribbon on packages but if you want to hang them, simply add a ribbon or string loop to the back or use a Christmas tree hook slipped through the lace in the back. 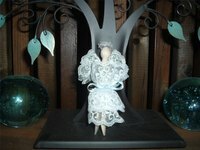 Proudly display your handmade lacy angels. Even if you try to make them all alike they will all be a little different and unique just like snowflakes, no two are exactly alike.